Want to Be Part of This ? Contact Us ! ​In 2004 Creezy Courtoy, former international top model, historian, anthropologist, perfume and luxury expert, Founder and Chairman of the International Perfume Foundation founded the New Luxury Code. Creezy Courtoy lobbied for more than 15 years for the perfume industry to put back flowers and other natural materials into perfumes instead of synthetic alternatives, however consumers still believe there are flowers and natural materials in these products. She realized that almost all industries were having similar issues, and that there was an urgent need for a change if we still wanted to keep our heritage and the art of living and well-being. Starting in 2008, she began organizing conferences and events explaining the real meaning of luxury and that real luxury could only exist if a code was put in place to remind us of the real meaning of luxury: The New Luxury Code. "Lux" in latin means "Light"
Today, The New Luxury is the re-birth of luxury with its original meaning. To understand New Luxury we need to remember what used to be true luxury for consumers: a product bringing added value and well being. Luxury lost its real, essential meaning and has been replaced by marketing, packaging and co branding giving consumers the illusion of value. Today more and more consumers want to buy real products instead of celebrities' images projected in advertisements and they are looking for the validation that their purchases are authentic luxury with real core values. The New Luxury Code is that validation for each sector, company and industry to change. 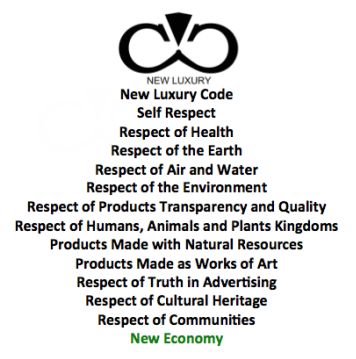 The New Luxury Code is a code of respect and a basic moral knowledge that has existed from the beginning of time. It has been forgotten, but should be revived and protected as a guide for our communities. Adapted to each sector of activity, The New Luxury Code allows companies to create products with respect for everything from the start of production to the end use by consumers providing them authentic value. New Luxury is the start of The New Economy. Increasing consumer awareness about product sustainability and ethics has create an urgent demand for change that will not only bring improvement in products but also create millions of new jobs worldwide. « The New Luxury Movement is the Wind of Change that will allow each of us to effortlessly enter the New Economy. This New Economy has a new Code, a very simple code of respect that has long been forgotten by industries but today is so important for the survival of our well being and the re-energizing of community life».